Starring: Brad Pitt, Jonah Hill, Phillip Seymour Hoffman, Chris Pratt, Robin Wright, and Kerris Dorsey. Rated: PG-13 for the naughty words sometimes said on the field. 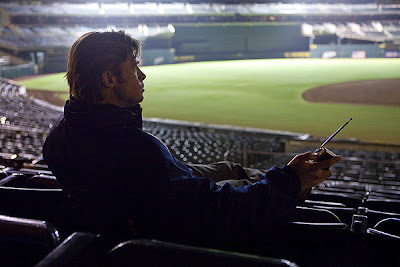 Moneyball seems like the type of film made just for my own personal pleasure. It’s a baseball film (check), but not a conventional sports movie (check). Instead it deals with minutiae (check) that was seen as a rational approach to a game built on emotions (check), and it’s really about nerds attempting to take over the house (check). 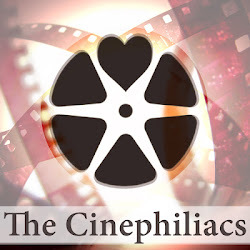 This is a film that may scare plenty of audiences—it’s about baseball statistics, after all—but has been artfully crafted for both mainstream and art house appeal. This ain’t no field of dreams. The film, directed by Bennett Miller, is (loosely) adapted from Michael Lewis’s non-fiction bestseller, but has instead used the statistics story as a structure to approach a more classical underdog story. It’s the story of the 2002 Oakland A’s, a paltry baseball team with a payroll of just under $40 million. In the opening scenes, we watch the 2001 A’s get trampled on by the Yankees, a team with three times the amount of payroll. 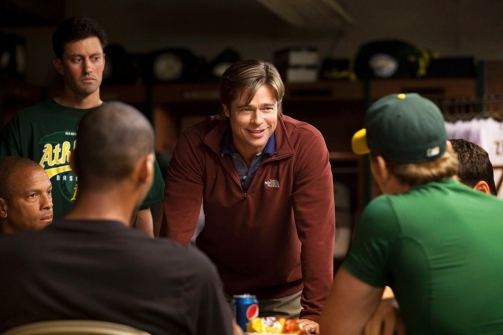 We watch Billy Beane (Brad Pitt), the A’s general manager, attempting to stay away from the game. He keeps a radio on him, and can’t help but turn it on every once or so, eventually deciding to stomp it to death instead. Billy likes to win, bur what he can’t stand, is losing, and decides he’ll do anything to prevent that. Looking at his next year, preparing to lose his three superstars (including Johnny Damon and Jason Giambi to the Red Sox and the Yankees respectively), Beane notices that his team and his means simply aren’t equipped to play in the same league. He watches a group of old time scouts (all at least twice Mr. Pitt’s age) discussing potential replacements, talking about their character and the way they look when they strike a ball—things anyone can recognize as pointless. 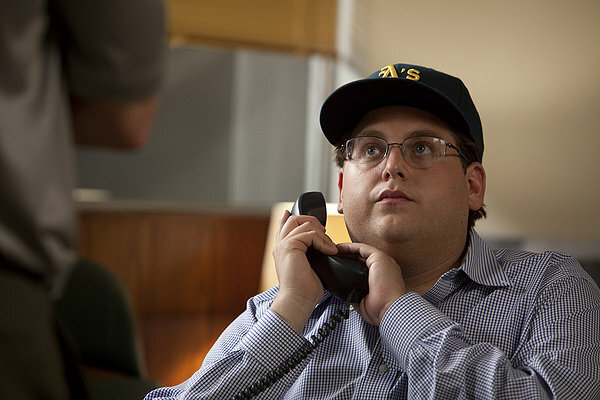 Instead, Beane finds a hero instead in Peter Brand (loosely based on Paul DePodesta), a Yale economics graduate played by a serious faced Jonah Hill in oversized suits. Brand isn’t really portrayed as a baseball fan as much as a baseball scientist—he explains early to Beane that the key to the game isn’t superstars, but undervalued players who deliver on statistics such as On-Base-Percentage that others ignore. The key to winning baseball is not psychological; it’s mathematical. Moneyball had a long trek to the screen, starting off as a script by Steve Zallian before becoming a Steven Soderbergh docu-drama experiment that was canned three days before filming began. It’s difficult to say what Mr. Soderbergh’s version what have looked like, but the final pen on script by The Social Network screenwriter Aaron Sorkin is evident in the film’s obsession with details and witty banter, especially a scene in which Beane and Brand play other GMs against each other in order to score a big trade. Mr. Miller though, coming from a more nuanced direction (his last film was Capote), let’s the dialogue breathe a little more, and gives us plenty of shots of Beane starring off in the distance, with his glowing eyes shining thanks to director of photographer Wally Pfister. Beane is somewhat of an enigma. His motivation, we are given in the film (the book gives a much more nuanced approach, along with a lot more unique detail that had to be simplified), is based on his own experience as a player, being signed by the Mets out of high school, only to flunk out, all thanks to the scouts that “recognized” his talent. Beane would be a difficult guy to get behind in another movie, but Mr. Pitt uses his screen presence to make him magnetic. There’s nothing big or showy here, but Mr. Pitt knows how to fill in those details missing in the script. He’s the type of actor your eyes simply follow on the screen, and it helps since Beane isn’t exactly a conventional hero, and somewhat of a villain in many ways. Moneyball the movie attempts to argue that the mathematical approach taken by Beane and Brand is what led to the team’s dominant success during the regular season in 2002, though some have argued for other factors that may have been unrelated (a good Slate piece this week summarizes the counterpoint to Mr. Lewis’s book). Nonetheless, Mr. Miller breaks the sports convention by not focusing on the field, but instead the backrooms. We get montages of statistics and an artfully composed shot of someone getting ball four, not a home run. The underdogs are not skimpy players that just need a shot—they are the MBAs who never even got on the field. 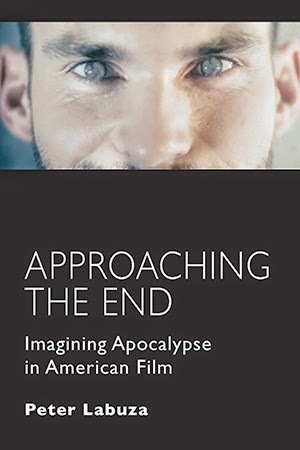 The film eventually gives into a little more baseball convention as it nears the end—and it’s one big baseball game is overly dramatized to make up for a film that is, after all, about a sport. Mr. Sorkin also lets the script take a little more than it can chew in terms of character; a subplot involving the fights between Beane and coach Art Howe, played by Philip Seymour Hoffman, is established early on but later dropped. And another involving Billy’s daughter, never finds its footing, despite it’s apparently crucial involvement in the film’s final sequence. Like Mr. Sorkin’s look at Facebook in The Social Network or even Mr. Soderbergh’s recent disease thriller Contagion, Moneyball suggests there is a battle brewing between our emotions and our logic in the age of technology, and what the implications in our traditions could be. In a late scene, Beane and Brand discuss a potential money offer. “It’s what the money stands for,” Brand suggests, taking out the emotion and considering it in terms of a statistic. But can we just live on our logic? Moneyball poses that question in a time where these ideas have never felt more at odds, and thus, a baseball movie teaches us a little less about baseball, and a little more about ourselves.